During this trip, it has been amazing how the days have blended into each other. There are times when it has been hard to even remember what we did in the morning (before breakfast) by the time lunch rolls around. In some ways, a “day” is not a useful unit of measurement for time. Instead, things happen in moments. Sightings of mammals and birds require you to be at the right place at the right time. Yesterday, during dinner, a call came into the mess hall from the flying bridge — sperm whales and killer whales off the port bow. Within seconds, everyone hustled into gear, shoveling down the last bites of food, clearing their plates and heading up to see the whales. I went all the way up to the flying bridge and was able to see three different sperm whales catching their breath before diving back to the depths. Ernesto also showed me the killer whales through the big eyes. As sperm whales can be down for 45-50 minutes, it is very exciting to catch them at the surface as we are moving to fast to see them on their next trip up. In addition, timing is important to ensure that operations on the ship continue smoothly. For example, fishing operations involve three teams (officer on deck, the deck crew and the scientists) all working together to ensure that the fish we spot get in the net, on the boat, and processed as quickly as possible. 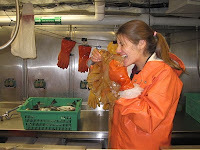 As Katie, Michele and I became more familiar with processing, we were able to move through the hauls much faster. On Tuesday, we completed three hauls in our shift and still had time to catch up on emails, learn about the Aleutian volcanoes and attempt to master some old-school knots. While we’re on the subject of timing, I have to mention the crew’s and scientists’ comedic timing. I can’t tell you how much time I have spent laughing and joking while on this cruise. It could be as simple as a funny face someone makes when confronted by a huge jellyfish or as nerdy as when someone uses the word of the day in a sentence. As the trip comes to a close (we will be in port by 9 am on Friday), I have started to think about how I will take this experience back to my classroom and to my friends and family. In addition to the science and the amazing sights I have seen, I will definitely take the memories of how often we fell out of our chairs laughing. 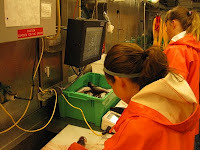 This entry was posted in 2010, NOAA Teacher at Sea, Rebecca Kimport and tagged Alaska, Oscar Dyson, otoliths, Pollock. Bookmark the permalink.